The WIN for KC Women's Triathlon & Duathlon is an all women’s triathlon and duathlon that was voted one of the top beginner triathlons in the world by Triathlon Business International. You are an athlete! You can do it! - Individual Triathlon registration PLUS an 8-week curated program comprised of 3 coach-led group training sessions per week, 7 race preparedness clinics, Cycling Kansas City annual membership, commemorative WIN for KC branded gift, VIP space withing transition area, kick-off event & post-race celebration. - A Team Relay is made up of two or three participants who compete in a team format during the race. Team members are divided up among the three legs (swim, bike, run) of the course, with one team member competing in no more than two legs. The Team Captain creates and pays for the entire team, and the other members will select the Join a Team option below to register. - Select this option if your Team Captain has already created and paid for your Relay Team. - The Tri Girls program is structured to allow girls 6-12 years old to complete a triathlon on their own time, at their own pace. They can complete the triathlon independently, or they can refer to the suggested training guide. The training guide takes girls safely from inactivity to triathlon finisher! 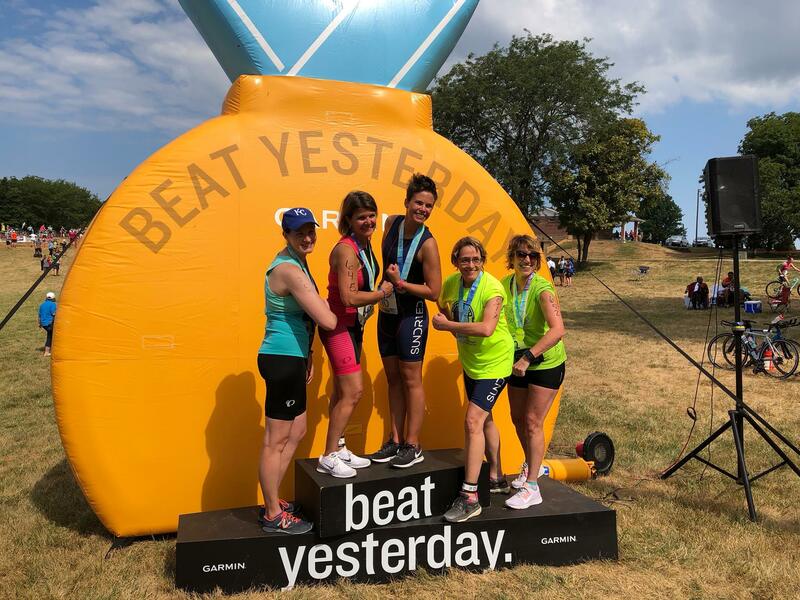 Girls who register and complete a Training Log are then invited to come to the WIN for KC Women’s Triathlon & Duathlon presented by Garmin on Saturday, July 27 and complete their journey by crossing the finish line! Triathlon Course: The swim will be in the water to the south of Sailboat Cove on Smithville Lake. The transition area will be on a paved parking lot near the beach. The bike course is mostly flat with some rolling hills on county highways. The run is on the paved trails to the southeast of the transition area. Duathlon: The first run will be on a paved trail near Sailboat Cove. The transition area will be on a paved parking lot near the beach. The bike course is mostly flat with some rolling hills on county highways. The second run is on the paved trails to the southeast of the transition area. A Team Relay is made up of two or three participants who compete in a team format during the race. Team members are divided up among the three legs (swim, bike, run) of the course, with one team member competing in no more than two legs. Age Groups: 12-14, 15-19, 20-24, 25-29, 30-34, 35-39, 40-44, 45-49, 50-54, 55-59, 60-64, 65-69, 70+ and Athena. Note: We will be following the USAT age-up rule: your age group placement will be based on your age as of December 31, 2019. Athena participants will be placed in the Athena division and not eligible for age group awards. All athletes MUST come to packet pickup. If you have extenuating circumstances or traveling from out-of-town and cannot make it to packet pickup, please contact mosias@sportkc.org to make special arrangements. *According to USAT regulations all participants are required to show a photo ID at packet pickup before receiving race materials. This means that no one besides the participant can pick up their packet. We strongly advise all athletes, volunteers and spectators to carpool and arrive as early as possible to the event. Athletes, please arrive between 5-6:15 a.m. to allow time to park, transport bike and gear, get set up in transition area, etc. We work with Park It parking services to provide parking for all of our participants and spectators. We ask for your cooperation with the parking staff as they work to fit everyone’s vehicle safely into the lot. Athlete Parking – Vehicles displaying the parking tag may park in the designated Athlete Parking area. This Parking area is closest to the race site (off Paradise Road). This parking lot will be closed from 7:30 to 10:30 a.m. or until the last cyclist is off the bike course. No exceptions. If you need to leave prior to 10:30 a.m. there is a drop off area at the corner of Paradise Road and Collins Rd. A spectator may drop off an athlete and then use the Spectator Parking. Volunteer and Sponsor Parking – Vehicles displaying the appropriate permit may park in the designated Volunteer and Sponsor Parking near the transition area/race site. Spectator Parking – Vehicles that do not have an Athlete Parking tag will need to park in the Spectators Parking. This parking is located south of the convenience store on Collins Road/Camp Branch Road at the Kelsey Youth Camp. There will be shuttle service available for spectators use only from Kelsey Youth Camp to the Paradise General Store (8419 Collins Rd, Paradise, MO 64089). Spectators will be asked to walk from the Paradise General Store to the race site (which is about a half mile walk). If you will be traveling with someone that may have difficulty making the walk, please bring along their handicap parking pass. This will allow you to park in the volunteer and sponsor parking lot. Registration fees are non-refundable. Once your registration entry has been received, you will not receive a refund if you cannot participate, or if the event is cancelled because of weather, natural disaster or other unforeseen circumstances. The race director reserves the right to cancel this event if weather conditions pose a danger to the participants. July 27 7:30 AM CDT - Race Starts!